The Dragon, son of Heaven, harbinger of wisdom and goodness bestows his blessings upon those who follow nature’s path. This amazing system was reputedly developed in the 1700’s by mountain dwelling Daoist master Li, Ching-Yeun. Dr. Painter has spent over thirty years researching and updating his modern version to make it even more accessible and physiologically empowering for students of all ages and levels of experience. The seminar course which can be taught as a series of weekend workshops includes training in : Power Standing Meditation, Linear and Circle walking Qigong, solo and partner games to develop prehensile “Dragon Body” qualities and much more. Flying Dragon Qigong will give you an amazingly high level of mind/body awareness and help you develop powerful internal connections for greater health, relaxation and vitality. In Jiulong Baguazhang there is special form of Qigong practice that is just for health and longevity. Dr. John Painter, using this method, has been able to stay highly active and virtually cold and flu free for over thirty years. Today at 56 years of age his resting heart rate is between 48-50 Bpm. Blood pressure is 119 / 75 and he has almost tireless energy. Unlike many so called “Masters” Dr. Painter did not go to China and study for a few days or weeks. He was practically raised by Chinese Master, Li, Longdao of Sichuan province who was living in the U.S.A from 1946 to 1968. It was Master Li who taught Dr. Painter the Daoqiquan family system. Dr. Painter does not claim to be a master, just a student of the “way” working to help others and himself attain true health and longevity through the methods of Nine Dragon Baguazhang practice from the Li family. The health system Jiankang (for physical health) is called Flying Dragon Qigong. Here is some information on it’s function from lab tests. 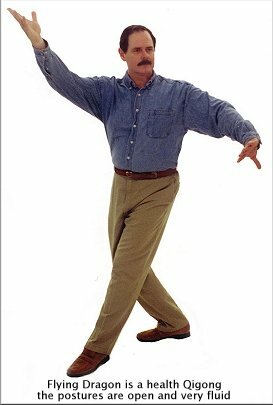 The Life Sciences Qi Research Institute in Arlington, Texas conducted a series of medical and physiological tests for three years from June 1990 to December 1993 on subjects performing Jiulong Baguazhang™ as a Qigong and health exercise method. Subjects used both Zhandouli (Martial) forms and also Jiankang (Physical Health) or Qigong forms of the Flying Dragon Qigong exercises and Spring Rain Exercises. 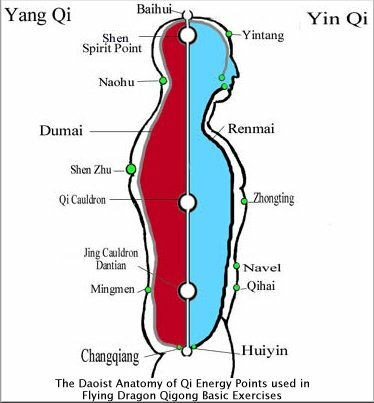 Baguazhang Martial and Qigong practices were found to incorporate a series of “psycho-physical” postures which have the ability to stimulate brain wave activity in creating an intuitive physical and mental link between the right and left brain hemispheres. 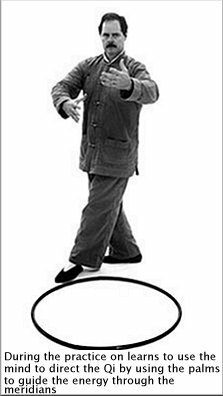 Bagua Qigong of the Jiulong system shows great promise as a safe method for stimulation of the endocrine system, cardiovascular system, and neural systems of the human body. Baguazhang martial practice is capable of producing gains in strength, flexibility and aerobic conditioning hitherto unrealized by many other forms of exercise. Baguazhang can easily qualify as a form of “soft” aerobic exercise. The techniques of Baguazhang can be adjusted to suit the beginning or advanced student. Tests indicate that Bagua Qigong is found to be effective for aiding in attaining freedom from stress and a balanced emotional stability in habitual practitioners. Baguazhang and Bagua Qigong has shown in controlled testing that when combined with a prudent dietary program the life expectancy and health potential of an individual can apparently be increased. Students who perform the Qigong exercises for fifteen minutes a day, five days a week, and follow a sensible diet remain virtually free of colds, ‘flu and other ailments. Bagua Qigong practitioners report that infections are reduced significantly in a very short time, due to the flushing action on the lymphatic system from the circle walking and linear forms. Physical strength and energy levels in Baguazhang and Bagua Qigong students increase due to the aerobic effects and the release mental neuromuscular tensions. From the experiments conducted in physical conditioning and stress relief there seems to be a clear indication that this particular style, Jiulong Baguazhang™, is definitely capable of inducing high levels of physical fitness. There was also a marked increase muscular hypertrophy and decreasing body fat levels. The exercises were also functional as a stress relief mechanism through a reduction in brain wave activity associated with states of mental anxiety. Today it is an accepted scientific fact that stress levels are in direct proportion to the individual’s life span and susceptible to various forms of illness throughout life. Ninedragon Bagua Qigong has shown in controlled testing that when combined with a prudent dietary program the health potential and possibly life expectancy of an individual can be dramatically increased. Students who perform the forms for twelve to fifteen minutes a day, five days a week, and follow a sensible diet remain virtually free of colds, ‘flu and other ailments. Infections heal themselves in record time, due to the flushing action on the lymphatic system, and energy levels in students increase while stress levels markedly decrease. Hz.= Cycles per second of brain wave activity used to indicate levels of awareness, consciousness, creativity and relaxation. Beta = Waking state. From relative calm to anxiety levels : 14-40 Hz. Alpha = State of restful relaxation free of stress associated with meditation and creativity : 8-13 Hz. From the experiments conducted in stress relief there seems to be a clear indication that Nine Dragon Bagua Qigong is definitely capable of producing a marked reduction in brain wave activity associated with states of mental anxiety.